Whether you’re on your first or hundredth OpenStack deployment, any administrator will tell you that getting the initial deployment configuration correct is crucial. This gets easier with experience, but what can one do in the meantime to supplement that knowledge? Enter two tools: clapper, and the network isolation template generator. Firstly: the network template generator. If you’ve read through any of the heat templates, or perused some of the upstream docs, you’ll know that configuring the networks you want in your OpenStack environment is a big part of the architecture. It’s also not easy to make changes to that once the environment is deployed. Typically, these configuration parameters are held in the network-environment.yaml template, as well as the nic-configs/<hostname>.yaml templates. To save on confusion and syntax mistakes in manual editing, Ben Nemec has created a GUI tool that creates these templates for you after running through a network creation wizard. With it, you can configure bonding, LACP, VLANs, bridges, etc. all on a per-node basis to satisfy your OpenStack environment needs. Ben publishes a video guide on the tool, as well as a blog on it’s use. Secondly: clapper. It’s a suite of ansible playbooks that run both prior to and post deployment to validate the configuration of the environment. Within the tool are prepackaged validations (ansible playbooks) submitted by community members to check for things like adequate file descriptors, open file limits, network gateways, disk space, ip ranges, network templates, detecting rogue DHCP servers, and many more. You can git clone this tool to your undercloud server and run validations at any stage of your deployment. It’s handy in helping you implement best practices that come straight from the experience of the OpenStack community. Got another tool to share? I’d love to hear from you. 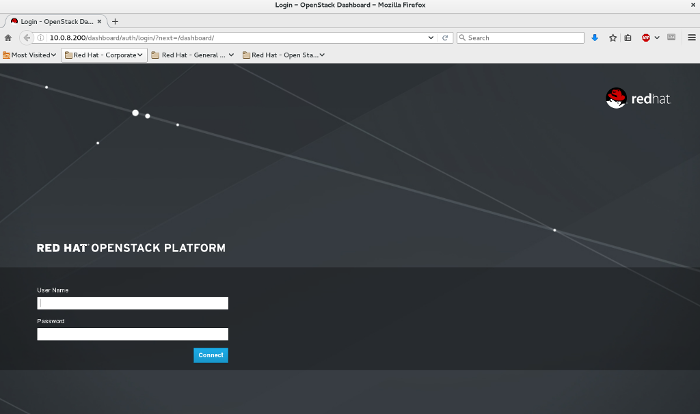 One that’s been picking up traction lately for ease of cloud deployments is the quickstart cloud installer. When I get some time, I’ll try it out and post a review. Previously, I went through a couple OpenStack topics on installers, and deploying an undercloud as part of a virtual OpenStack deployment. Today I’ll walk through the overcloud deployment, and hopefully by the end of this post you will have had enough details to get your own deployment up and running. This particular environment is for Red Hat OpenStack Platform 8 (Liberty), but the same steps will apply to Mitaka as well. There isn’t a ton of change in the deployment methods from Liberty to Mitaka, the templates here will apply to either. Having previously worked through undercloud deployment, you should have a working and configured undercloud that’s ready to further configure the overcloud and how it is to be deployed. In the Director Installation and Usage guide, we’ll be starting from Step 4.7. 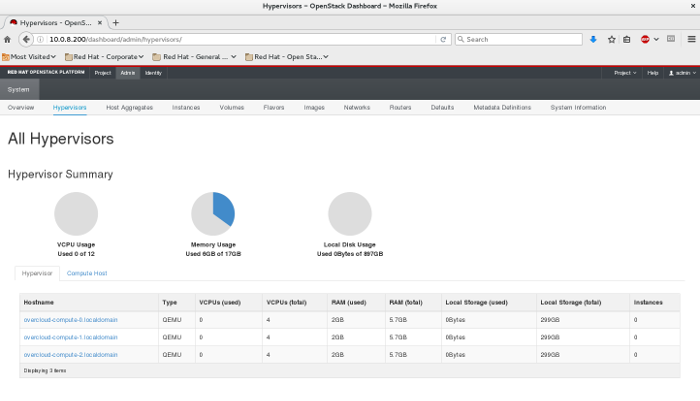 You’ll want to obtain the overcloud images either directly from access.redhat.com, or from the rhosp-director-images RPMs. (It might be handy to have that guide open and follow along here. I won’t post every command from that guide here, but will do the areas that might not be so clear). These images displayed here, as well as the ones copied to the /httpboot directory serve a couple purposes. The /httpboot images are introspection images, or what the undercloud host will copy to the overcloud nodes as their hardware is being inspected (or introspected as it’s also called). What this introspection process does is it takes an audit of the hardware you’re giving the overcloud, and it puts it in an inventory in the undercloud, so the undercloud knows a little about the nodes it’s about to provision. This is used to help classify baremetal servers into node types (compute, controller, etc.). The bm-deploy* images are used during firstboot (a PXE boot) for the baremetal hosts you’ve set in the overcloud. These baremetal images are used to get the overcloud node(s) to a basic networked OS, then it copies the overcloud-full images to disk, which the node then uses to permanently boot from in the traditional server OS booting process. I know it’s a little convoluted process, but each image is purposeful and this functionality is basically a replication of the PXE boot process you may be familiar with from a cobbler server, or other PXE boot environment. During the undercloud installation process, neutron network entries used for provisioning get created. This is commonly known as the “control plane” network, of which handles the provisioning traffic for nodes, as well as all of the API and Management traffic between the nodes once the cluster is up and running. In a sincle-nic-vlan deployment (the one we will be doing), this physical control plane network will have this individual API and Management traffic broken out into different subnets and VLANs for separation. After completing Step 4.8 in assigning a nameserver to this neutron network, we’ve completed the undercloud configuration and are ready to move on to configuring the overcloud. Chapter 5 starts off with configuring the basic overcloud requirements. I’ve previously decided that we’re going to be doing the “Medium Overcloud with High Availability and Ceph Storage” deployment scenario. You can check out other deployment scenarios in Chatper 3.1 in the same guide. The deployment scenario we’re going with has 3 controllers, 3 computes, and 3 ceph storage nodes. I think this will give you good exposure to all the important aspects of a truly production ready OpenStack deployment. This will give us true high availability with 3 controllers. It also gives us flexibility in compute capacity to create different availability zones, or tiers of compute offerings with exposure to live migration, as well as instance HA for automatic failover (configured separately after deployment.) Also, this gives you good exposure to ceph software defined storage, configured in a clustered environment, with a reasonable amount of storage to create instances and volumes without restriction and in a way you can explore its performance. The only thing you might want to do differently with this deployment is separate the traffic out further to dedicated NICs or bonds for increased resiliency, or add more compute/storage nodes for capacity. The first node is a compute node, and the last node is a storage node. (There’s the other 7 nodes in between these two, but I’ve truncated it for brevity). This file expects the MAC address of the provisioning NIC, and since we’re using the pxe_ssh driver in the virtual lab, we’ll be populating the pm_user, pm_password, and pm_addr fields to accommodate. If you’re using KVM for your virtual environment (recommended), this is what you’d use for deployment. If you’re using VMware, you’ll want to use the fake_pxe driver. More info on both of these drivers are in Appendix B.6, and B.7 of this deployment guide. The reason I say the pxe_ssh driver is preferred is because all the power management needed to be done using the fake_pxe driver with VMware needs to be done manually. (Rebooting of nodes during provisioning is automatically handled by ironic and the iDRAC/iLO/UCS/pxe_ssh drivers. You’ll need to manually boot and reboot VMs if you’re using the VMware driver, so the KVM option on a new deployment is much easier to use to get familiar with the provisioning process first). Back to the instackenv.json file, the pm_password field expects the private SSH key of the pm_user, not it’s password. It expects a “\n” character at the end of the first line, and the beginning of the last to parse the key correctly. Also, you’ll want to setup password-less SSH access from your undercloud (director) node, to the hypervisor host as the pxe_ssh driver is essentially a wrapper to virsh, which handles the power management of your KVM VMs. The pm_addr in my case here is my hypervisor host IP. Before importing this file, you’ll want to check that you can successfully SSH from the undercloud to the hypervisor without a password as both the root and stack users. Use the ssh-copy-id tool for this. The next step is to inspect (introspect) these nodes hardware details. You’ve already populated the major details it needs, so this step is mostly to discover additional root disks, and for automated node classification if you’re importing 100s of nodes at a time. This step isn’t mandatory, but I’d recommend doing an introspection and watching your VM console just to become familiar with the boot process. The next (and critical) step is to tag these nodes with the overcloud profile you want them deployed as. So compute, controller, ceph-storage, etc. In our case, we’ll tag the three compute nodes with compute, the controllers with controller, and the ceph storage with ceph-storage. Pretty straight forward right? This is often an overlooked step and causes many issues come deployment time if your nodes are tagged in a different way than what you’ve told the undercloud to deploy. When deploying, remember that the nodes available to you during a deploy are the ones in the ironic inventory so in the future if you decide to change the 3 ceph-storage nodes to 3 additional compute nodes, you’ll need to come back here and re-tag them as such. This shows my first node is tagged as compute, and the summary of all nodes says I’ve got 3 of each profile tagged. Awesome! Ironic now knows about all the overcloud nodes we want to provision, and it knows which role each should have. Now for probably the most complicated part – heat templates. This is probably the most confusing part of an overcloud deployment, is how to setup the heat templates so that the nodes get deployed in the architecture that you want them to. In this section (now in Chapter 6 of the guide), I’ll just give you the templates we’re going to use, and briefly explain why. As you get some practice deploying a few environments and seeing the configuration first hand, these templates will start to make more sense. For me this was a little information overload reading all the options I could deploy with, it made understanding the one I need difficult to identify at first. I’ve uploaded my yaml templates to my github repo, so you should be able to use these verbatim assuming you’ve setup your VMs and undercloud exactly as I have. I’ll dive into some of the notable details though. Keep in mind that these are .yaml files, and indenting is important. ## Whether to enable iscsi backend for Cinder. ## Whether to enable rbd (Ceph) backend for Cinder. ## Whether to enable NFS backend for Cinder. ## Whether to enable rbd (Ceph) backend for Nova ephemeral storage. ## Glance backend can be either 'rbd' (Ceph), 'swift' or 'file'. Here we tell heat that this network interface type is an OVS Bridge (ovs_bridge). And that it’s going to be using the control plane network details, with nic1 as a member interface. In that ovs_bridge, we include all of the API networks and their VLANs. This is the config that isolates all the traffic over the provisioning NIC. Since I’ve attached a second NIC as an external nic, I’ve created a new interface entry with the external network details, and commented out that inclusion in the provisioning NIC. We’re including the network isolation template to indicate we want to isolate the networks. Also included is our network and storage templates, the timezone, and the node count and node profile of each of our overcloud nodes. Additionally we set an NTP server (very important for the time to be correct among all nodes), and the tunnel types for neutron. I like to include the validation flags as well, as they’ll fail the deploy right away if it notices any misconfigs in your yaml files, which makes it quicker to fix. Also, the timeout flag specifies how long to wait before timing out the create if it gets stuck on a task. This way if you do hit an error, you’re not waiting hours for the deploy to report back that it failed. PKI initialization in init-keystone is deprecated and will be removed. Warning: Permanently added '172.16.108.24' (ECDSA) to the list of known hosts. 2016-09-11 20:39:57.599 15222 WARNING keystone.cmd.cli [-] keystone-manage pki_setup is not recommended for production use. Congratulations! You’ve stood up your first OpenStack environment. If you get stuck at any step along the way, comment below. I’ll point you in the right direction to get it deployed. The reason we’re using 3 of each node is that it gives you true high availability with the controllers, as well as as much of a simulation of real world compute and software-defined-storage functionality. On your physical server, you want to make sure that virtualization extensions are enabled in the BIOS, and on your compute nodes you either inherit the host’s CPU characteristics, or you manually enable nested virtualization. This isn’t necessary for the overcloud deployment itself, but it is necessary to create an instance inside the OpenStack environment. 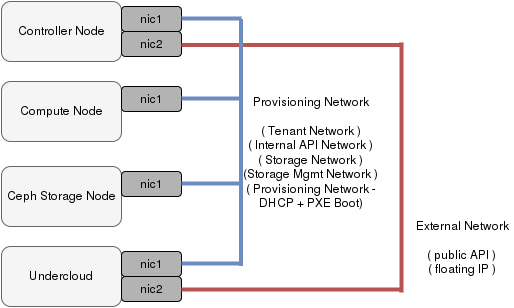 Nic 1 on each node is essentially acting as a trunk, carrying all the types of traffic in the OpenStack environment that aren’t on the external network. In an actual production deployment, you may want to separate these out further into their own physical networks, bonds, VLANs, etc. But for our purposes, everything is going to be on one NIC, in the 172.16.108.0/24 subnet. Because we’re using a virtual environment, we’re also omitting the IPMI network. Our node out-of-band management is going to be handled by the pxe_ssh driver. With this driver, the undercloud uses virsh to control the power management of our VMs. Created flavor "baremetal" with profile "None"
Created flavor "control" with profile "control"
Created flavor "compute" with profile "compute"
Created flavor "ceph-storage" with profile "ceph-storage"
Created flavor "block-storage" with profile "block-storage"
Created flavor "swift-storage" with profile "swift-storage"
There is also a stackrc file at /home/stack/stackrc. Congratulations, TripleO has been installed and configured. We’re ready to start the configuration of the overcloud nodes. Next post, I will get into the heat templates required to do this, and some notable configuration items in them.